Film screening with live music. Splendor opens its doors to the Amsterdam music collective MAZE who invite you to travel with them through their creative avenues of open structures, hybrid scores and radical concepts. Featuring pieces by Ablinger, Bennett, La Berge, Kyriakides, Pisaro, a.o. 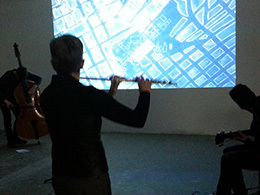 Justin Bennett’s Blueprint uses a hand-drawn animation of city maps and stencilled texts to guide and question a group of improvising musicians. The performance will be preceded by a discussion with the artist.